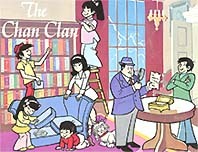 This family of super sleuths are comprised of the Chinese detective Charlie Chan, his 10 children and their family dog, Chu Chu. The children always try to help out their dad to bring in the bad guy, but in the meantime, get caught up in many adventures as they travel the world. The voice of Charlie Chan is played by (Keye Luke) the original and all wise, Master Po from TV's "Kung Fu". In the second successful season, Jodie Foster (Silence of the Lambs) was the voice of Anne Chan.